Wireless gadgets seem futuristic to most of the population, but never judge a book by its cover. Although wireless may seem much more convenient and futuristic, nothing beats the quality of cables. Charging pads are growing ever more popular with the world market as our technology begins to expand. Chrysler and Toyota are two of the first automakers to initiate the move toward this technology. Soon, more and more carmakers will be joining the bandwagon. 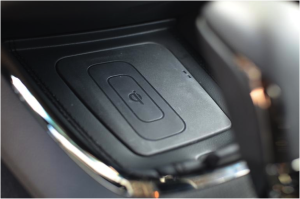 These charge pads are usually located on your console between the driver and passenger seats. Most phones are supported, even without a special case to produce an electrical current the charging pad can support. All you have to do is place your cellular device onto the pad and it begins charging. Seems simple enough, right? But is it truly worth purchasing as an add-on option? Maybe I’m just a fanboy for cables but, nonetheless, they are more effective than anything wireless. When an electronic device is connected wirelessly there is a mini-second lag. For example, when downloading applications to your computer, you’ll notice an Ethernet cable is quicker than a Wi-Fi connection. Wired connections travel straight through the cable to the device, while wireless connections travel through the air and find the paired electronic, which may take an extra second or so. So if you want to feel like you’re in the future and don’t care much for the speedy charge-rate cables will give you, then the wireless charging pads are the best piece of new technology for you. But, if you want to kick it old-school and have premium charging time, stick with the USB cables.